So the Zofran I’m on doesn’t really stop the nausea, but it does seem to stop the puking, which is something at least. It would be nice to actually feel good or even normal as opposed to sometimes just semi-functional, though. Plus, I have experienced some unsavory side effects of Zofran, but detailing them here would make this post contain Too Much Information, so I’ll just leave it at that. 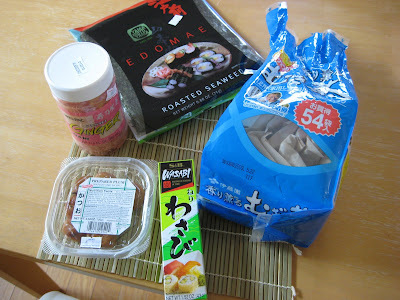 On Sunday I took my friend N (who happens to be Japanese) to the Asian grocery store on campus. She helped me find all the things I would need to make my own sushi, and she even gave me a bamboo mat that you use to assemble it. She told me some of the things that Japanese women use for morning sickness. Japanese pickled plums are supposed to be good for it, so I bought some of those at the store, and she gave me some wheat tea, which she said was good for nausea in general. Clockwise from top: Seaweed, wheat tea, wasabi, pickled plums, and pickled ginger. After I got home, I realized that the pickled ginger contains phenylalanine--the artificial sweetener in diet soda that is some kind of carcinogen or neurotoxin. I never touch the stuff when I'm not pregnant, and now I'm too afraid to eat it because I don't want Fig exposed. So much for the pickled ginger. As for the wheat tea—it smelled kind of like charcoal and didn’t taste quite as bad, but it wasn’t great either. I added a teaspoon of Gutzmer honey to make it more palatable. Not sure if it did anything for the nausea though. The pickled plum was… wow… really nasty. Much like how you might expect a shriveled plum soaked in salt and vinegar would taste. Actually, much worse. I decided that if this was the cure for morning sickness, well, it might not be worse than morning sickness per se, but at this point, it was kind of splitting hairs. I was really proud of my first attempt at making sushi though. It was surprisingly easy. 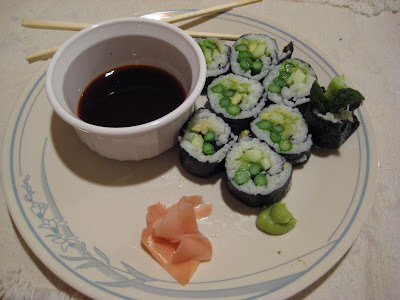 I started out by making some sticky white rice and adding 2 tablespoons of sushi vinegar to it. Then you put a sheet of seaweed on a little bamboo mat and put a thin layer of the rice on top. In the middle of this, I put some (lightly) steamed asparagus, raw cucumber, and raw avocado. Then you roll it up, remove the bamboo mat, and cut it into little rounds. It’s that simple! I actually thought my homemade sushi was every bit as good, if not better, than the kind from the restaurant. In addition to the abating, but ever present, nausea, I’m also dealing with a rotten head-cold at the moment. I feel like kind of a wimp, but it is seriously unpleasant. I can’t breathe out of my nose at all, and as a consequence, I haven’t slept in 3 nights. Aside from the fact that I can’t smell things as strongly, it’s a real drag. I think my mad craving for sushi is partially motivated by Wasabi—which is so potent, it clears out my sinuses and gives me a good 5-10 minutes of breathing time after every meal. Also, I am pretty sure that Fig loves avocado. Avocado has tasted so good to me lately. Today I was feeling so sick that I couldn’t even go to the trouble of making sushi, so I just mashed up some avocado, mixed it with the rice, and put on some wasabi. Perfection. Probably by tomorrow all that will make me dry heave, so we’ll have to come up with something completely new to eat. It's always an adventure.